There is no archaeological evidence of a Scandinavian origin for the Przeworsk culture, but there is some evidence of an undetermined connection between north-western Europe (Jutland, Holstein, Mecklenburg) and central Poland, western Ukraine, and Moldova at the crossover from Early Pre-Roman Iron Age into the late period, during the second half of the third century BC. The nature of this connection is still the subject of study by a good many scholars from many northern and Eastern European countries, but it would seem to offer tentative support to a migration of early Germanic tribes from Jutland and surrounding environs. Much of Moldavia was occupied by the Germanic Bastarnae in the first century BC, but parts of this tribe were subjugated by Rome and resettled on the south bank of the Danube, while the rest came to be dominated by the Goths. Subsequently, the principalities of Wallachia and Moldavia were the first Vlach (Romance-language) states to form north of the Danube. They appeared once the incursions by nomadic Steppe peoples such as the Huns and Mongols had ceased. They were never subject to the Byzantine emperors in Constantinople, and they occupied territories that had only been partially occupied and then swiftly abandoned by the Roman empire in the third century. As with Wallachia, during the fourteenth century, the principality of Moldavia gained a degree of self-rule which ended with the Turkish occupation and rule of the Balkans. Moldavia is conquered by the Ottomans. Ottoman rule is not direct, and local princes are allowed to govern the principality. Michael the Brave of Transylvania briefly unites the three principalities that later form Rumania - Moldavia, Transylvania, and Wallachia. In occupied Wallachia and Moldavia, the Ottomans began the destructive practice of appointing Greek tax farmers, known as the Phanariots (from the Phanar section of Istanbul), as princes. They were placed in power simply to get as much money out of the land as possible. Tax Farmer of Wallachia (1716-1717, 1719-1730). Tax Farmer of Wallachia (1741-1744). Tax Farmer of Wallachia (1735-1741, 1744-1748). The Russian right of intervention is established at the Treaty of Kuchuk Karinarji. Former prince of Wallachia (1775-1782). Restored (1796). Russia begins to administer an area known as the Pale of Settlement. Initially this is small, but it increases greatly from 1793 and the Second Partition of the former Polish-Lithuanian Commonwealth. By the mid-nineteenth century it incorporates modern Belarus (eastern Poland at the time), eastern Latvia, Lithuania, the province of Bessarabia (modern Moldova), and western Ukraine. Having formerly been citizens of the defunct commonwealth, the Jewish population of the 'Pale' is restricted from moving eastwards into Russia proper. The Russians take Wallachia and Moldavia from the Ottomans in battle and occupy the region. Upon the advance into Russia of the French Emperor Napoleon Bonaparte, they sign a quick treaty and evacuate their troops northwards. Russia re-occupies both principalities and controls the area under Governor Count Kisselev. In 1834, Moldavia and Wallachia adopt a unified basic constitution, the Reglamentul Organic, which provides for their eventual unification. Russia again occupies both principalities, but is preoccupied fighting the Crimean War (1853-1856). Russia is weakened after losing the Crimean War. Austria occupies the principalities, which are now united as one administrative region. Effectively united with Wallachia as a single principality, the country is now under autonomous rule. Ruled both Moldavia and Wallachia. Abdicated. The personal union of the two Danubian principalities is consolidated into a new state which is called Rumania. Prince Cuza (known by the local form of his name, Alexandru Ioan Cuza) launches an ambitious policy of economic, political, military, educational and social reform, encompassing a parliament, land reform and the adoption of a civil code. Landed interests and disgruntled liberal politicians force the increasingly authoritarian Prince Cuza to abdicate. Parliament invites the Prussian Prince Karl (Charles) Eitel Frederick of Hohenzollern-Sigmaringen to succeed him. Prussian prince invited to rule both principalities. When the Ottomans are defeated in the Russo-Turkish War (1876-1878). Russia invades the area and Rumania is proclaimed independent. As in Greece and Bulgaria, a European prince heads the new monarchy. Charles / Karl of Hohenzollern is recognised by the Congress of Berlin, and Wallachia and Moldavia are officially united to form Rumania. The kingdom of Rumania is officially proclaimed, with Charles as its first monarch. Romanians in the Hungarian province of Transylvania form a National Party to campaign for their rights, but meet with repression by the Hungarian authorities. In the same year, the first modern-era wave of Jewish migrations back to Palestine begins with an event known as the First Aliyah. The Jews are fleeing pogroms in Eastern Europe, most notably in the territories of the Russian empire under Alexander III and his imposition of anti-liberalisation reforms. These may be partially the result of the Polish-Lithuanian January Uprising of 1863. Russia operates an area known as the Pale of Settlement, largely territory to the west which has been acquired from the former Polish-Lithuanian commonwealth. Today this forms Russia's western border region, and from 1791-1793 it has incorporated modern Belarus (eastern Poland at the time), eastern Latvia, Lithuania, the province of Bessarabia (modern Moldova), and western Ukraine. The Jewish population of the 'Pale' are restricted from moving eastwards into Russia proper and are now being discouraged from remaining in the western border regions of the empire. The Second Aliyah to Palestine is triggered in 1903 by an anti-Jewish riot in the city of Kishinev (modern Chişinău), the capital of the province of Bessarabia in Moldavia, now part of the Russian empire. Something like 40,000 Jews settle in Palestine, although only half remain permanently. Many others, evicted from their settlements in the 'Pale' head towards western Poland or America (something that is dramatically highlighted, if with a touch of artistic licence, in the film musical, Fiddler on the Roof, 1971. which has its final scenes set in 1905). 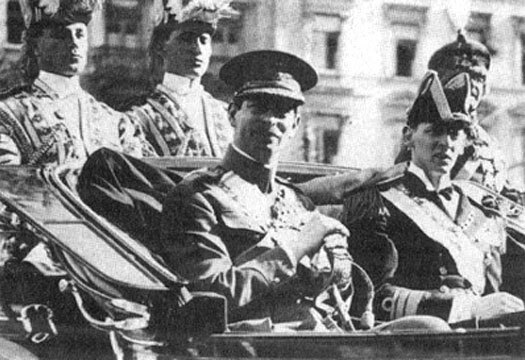 The death of King Karel has ended Rumania's alliance with the First World War Central Powers. On 17 August 1916, Rumania, long courted by the Allies, is finally persuaded by promises from France and Russia that it will gain the principality of Transylvania from Hungary. Its war effort is quickly defeated when it attacks into Hungary instead of holding a front against Bulgaria, as agreed. However, when the Russian and Austrian empires collapse it gets what it wants. Furthermore, the ethnic Rumanians of the Russian provinces of Bessarabia and Moldavia declare a Moldavian People's Republic in January 1918, with the Rumanian army close at hand. In April, these regions become part of Rumania proper. The country's gains in populace amount to about a quarter of its total figure, although it has lost Southern Dobruja to Bulgaria. The state of Romania (or Rumania in older usage) came into being as a principality in 1859 under Ottoman suzerainty. 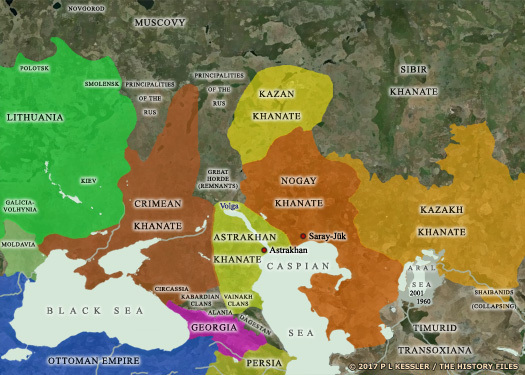 It was formed out of the late-Byzantine and then Ottoman-ruled Danubian principalities of Wallachia and Moldavia. The new country gained independence from the Ottomans in 1877-1878 following the Ottoman defeat at the hands of Russia. Karl (or Karel) of the Prussian royal family of Hohenzollern had already been invited to form a new monarchy for Wallachia, and so he became the first king of Rumania in 1881 when the kingdom was officially proclaimed. Northern Dobruja was soon added in return for Rumania's part in the 1876-1878 Russo-Turkish War and in compensation for the loss of some territory which abutted southern Bessarabia (mostly within modern Moldova). This gave the kingdom much of its Black Sea coastline to the north of the Danube. Much more territory was added out of the collapse of the Austro-Hungarian empire, between 1918-1920. Romanians in the Hungarian province of Transylvania had already formed a 'National Party' to campaign for their rights, but had met with repression by the Hungarian authorities. Now they too were able to join Rumania, in 1919, beginning the 'Greater Romania' period which lasted until 1940. King of Rumania, Bessarabia & Moldavia. Upon the death of King Ferdinand, his son Karel is prevented from succeeding him thanks to a scandalous lifestyle and a renunciation of his rights to the Rumanian throne. Instead his own son, the young Michael, is placed on the throne with Karel's brother Nicolae acting as regent. Karel spends three years in exile. Karel changes his mind about accepting exile and returns to Rumania. With the support of the governing National Peasants' Party he proclaims himself king, effectively deposing his own son. This is despite having permanently signed away any right to rule in official documents which had been written and signed in front of his own father. King of Rumania, Bessarabia & Moldavia. Forced to abdicate. As with elsewhere in Europe, this decade is an unsettled and dangerous one for Rumania, together with its eastern regions of Bessarabia and Moldavia. The country witnesses the rise of the green-shirted fascist 'Iron Guard' mass movement and weakened government after government as the country lurches towards nationalist leanings. Following the country's slide towards fascism and his own somewhat mixed relationship with fascism's leaders in Rumania, Karel II establishes an absolute monarchy - effectively a dictatorship. Russia seizes Bessarabia before Rumania becomes an active ally of Germany. The seizure is made under the terms of the Molotov–Ribbentrop Pact. The industrialised territory to the east of the Dniester, generally known as Trans-Dniester or the Dniester region, is taken from Ukraine and combined with Bessarabia to form the Moldavian Soviet Socialist Republic. The region of Bessarabia, on the west bank of the River Dniester, had been part of the kingdom of Rumania since 1918. Soviet Russia seized it in 1940 before Rumania could become an active ally of Nazi Germany. The seizure was made under the terms of the Molotov–Ribbentrop Pact. The industrialised territory to the east of the Dniester was generally known as Trans-Dniester or the Dniester region. An autonomous area within Ukraine until now, it was taken by Moscow and combined with Bessarabia to form the Moldavian Soviet Socialist Republic. The bulk of the Moldavian republic lay between the rivers Dniester and Prut. Two-thirds of Moldovans were and still are of Romanian descent, the languages being virtually identical, and the two countries share a common cultural heritage. This area was inhabited mainly by Russian and Ukrainian speakers who shared no real cultural or linguistic affinity with the Bessarabians. Increasingly alarmed at the state of the Soviet Union, the prospect of its break-up, and that of closer ties with Romania, the Trans-Dniester region of Moldavia unilaterally declares independence from Moldova. A long, narrow strip of territory on the east bank of the Dniester, its population is largely formed of Ukrainian and Russian speakers who do not share the largely Romanian heritage of the majority of Moldavians. Thanks to behind-the-scenes manoeuvring by the newly-elected president of the Russian republic, Boris Yeltsin, on Christmas Day 1991 Communist USSR President Gorbachev announces the termination of the Soviet Communist State. The Soviet Republics become independent sovereign states (if they had not already become so since 1989), including Belarus, Bulgaria, Czechoslovakia, Estonia, Georgia, Hungary, Latvia, Lithuania, Moldova, North Ossetia, Poland, Romania, Turkmenistan, Ukraine, and Uzbekistan. Today Moldova is a parliamentary republic with its capital in the city of Chișinău (often shown in English-language publications as Chisinau, and which was known historically as Kishinev). A landlocked country, it is surrounded to the north, east, and south by Ukraine, and to the west by Romania. The bulk of modern Moldava lies between the rivers Dniester and Prut, and is largely made up of an area formerly known as Bessarabia. This territory was annexed by the USSR in 1940. Two-thirds of Moldovans are of Romanian descent, the languages being virtually identical, and the two countries share a common cultural heritage. The industrialised territory to the east of the Dniester, generally known as Trans-Dniester or the Dniester region, was formerly an autonomous area within Ukraine before 1940, when the Soviet Union combined it with Bessarabia to form the Moldavian Soviet Socialist Republic. This area is mainly inhabited by Russian and Ukrainian speakers. As people there became increasingly alarmed at the prospect of closer ties with Romania in the tumultuous twilight years of the Soviet Union, Trans-Dniester unilaterally declared independence from Moldova in 1990 as Transnistria. They remain divided from Moldava but unrecognised as a nation state in their own right. 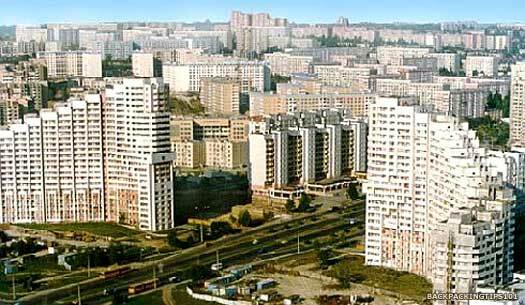 Moldova is one of the poorest countries in Europe and has a large foreign debt and high unemployment. It is heavily dependent on Russia for energy supplies, and Russia has not hesitated in taking advantage of this fact as a way of exerting economic pressure on Moldova. The fact that the Moldovan economy has traditionally been heavily dependent upon the export of wine to Russia has also allowed Moscow to apply economic pressure by occasionally banning the import of Moldovan wine. Following the official dissolution of the Soviet Union and the declaration of Moldovan sovereignty, fierce fighting takes place in the Trans-Dniester region as it tries to assert its 1990 declaration of independence in the form of a presidential republic. Between March and July 1992 hundreds die, and the violence only ends with the introduction of Russian peacekeepers. Calling itself the Pridnestrovian Moldavian Republic (PMR, also known as Pridnestrovie), Trans-Dniester's independence remains unrecognised and the region exists in a state of lawless and corrupt limbo. Moldova refers to it as Stînga Nistrului, meaning 'Left Bank of the Dniester'. The Moldovan parliament grants autonomous status to the Turkic-speaking Gagauz region in the country's south-west late in 1994. It has powers over its own political, economic and cultural affairs. The Trans-Dniester region (Transnistria) reasserts its demand for independence and also expresses support for a plan ultimately to join Russia in a September 2006 referendum which is unrecognised by Chișinău and the international community. It still houses a stockpile of old Soviet military equipment and a contingent of troops of the Russian 14th Army. Withdrawal had begun under international agreements in 2001 but this had been halted when the Trans-Dniester authorities blocked the dispatch of weapons. Subsequent agreements to resume the removal of weapons do not reach fruition as relations between Moscow and Chișinău cool. In November, Moscow issues an ultimatum telling Chișinău to withdraw from energy agreements with the EU or face losing discounts on Russian gas supplies from Russia. Wine is among a broad range of Moldovan agricultural exports that are banned by Russia before and after the country's signing of an EU association agreement, along with Ukraine and Georgia. But the pro-EU government defies calls from Russia for it to delay the deal's implementation. A royal funeral takes place at Curtea de Arges in central Romania on 13 August 2016. A day of mourning is also declared both in Romania and Moldova, and flags fly at half-mast. The ceremony is for Queen Anne of Romania, after she passes away in hospital in Switzerland on 1 August, at the age of ninety-two. Romania's President Klaus Iohannis, Moldova's President Nicolae Timofti, many other statesmen, and thousands of well-wishers have already paid their respects as her coffin lay in state at Peles Castle at Sinaia and at the Royal Palace in Bucharest.